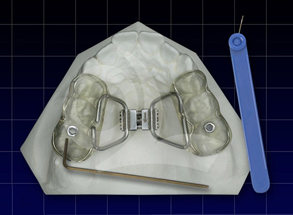 The Rapid Palatal Expansion Appliance with Debonding Screws. 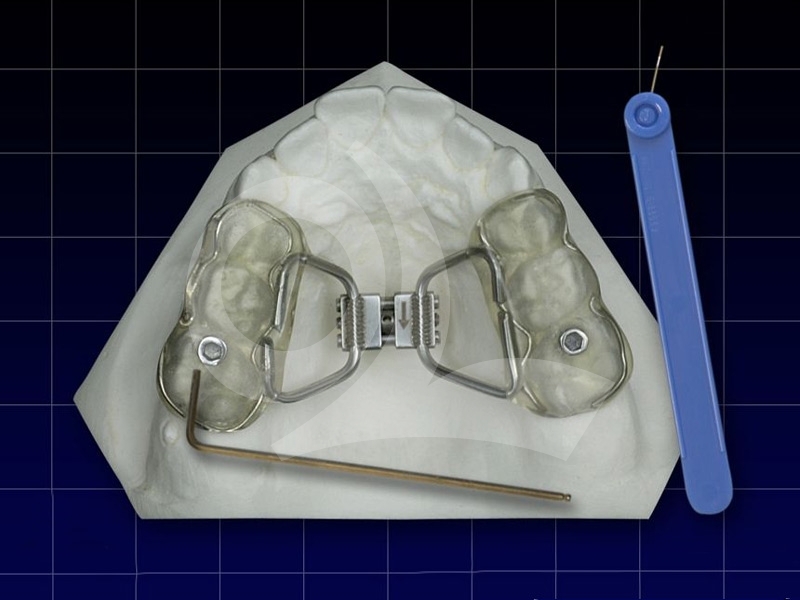 The use of this Rapid Palatal Expansion (R.P.E.) appliance means that you do not have to separate elements and fit bands: a sharp upper and lower impression are the only things you need to fabricate it. The height of the lateral bite will increase by 3 mm and this will be fully harmonised with the third and fourth quadrant. This height is important for the fitting of the debonding screws. The increase in height of the lateral bite fits closely with the premolars and molars in the upper jaw, so increasing stability and preventing torque in this area. The R.P.E. appliance is simple to remove once it has done its work. Simply turn the debonding screws with the accompanying spanner until the R.P.E. appliance is released. Tip: prior to fitting the appliance, fill the debonding screws with wax to prevent the formation of tartar.